Authentic 'Arctic circle' mugs by Scandinavian designers Aarikka. 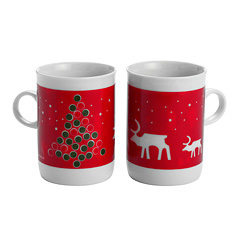 Show off your Christmas spirit by drinking mulled wine from one of these festive-themed mugs. Smaller than the average cup, there are two different Napapiiri mug designs included in each pack. One has a green Christmas tree and the other a typically Finnish moose design. You can choose to buy a pair for £16.59 or a pack of 6 for £49.75. Give your guests a warm welcome by offering them a Napapiiri mug of mulled wine on arrival. Napapiiri mugs also make wonderful gifts. They are perfect for newlyweds or couples who want to share their favourite Christmas tipple or, alternatively, for little ones to enjoy their favourite hot beverages.